Read Egyptian fairy tales from Andrew Lang’s popular collection and more. Jump to full list of Egyptian folk tales. 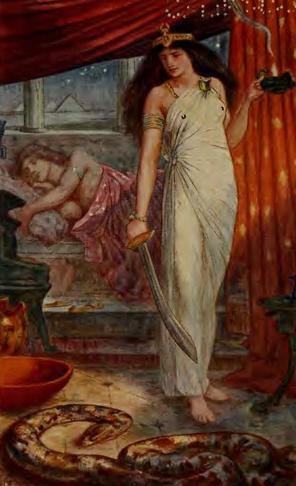 “The princess and the snake.” Illustration by H.J. Ford. Published in The Brown Fairy Book by Andrew Lang (1910), Longmans, Green and Co.
About: The fairy tales and mythology from Egypt are elaborate sacred tales of order, chaos and renewal, of gods and goddesses, who die and are reborn, and Pharaohs who maintain the order of the Universe. Egyptian mythology, like much of the world’s folklore and fairy tales, were origin stories that honored life, and helped people make sense of their world. Steeped in ancient mystery, the myths were largely religious texts that informed their rituals and ceremonious. Many Egyptian legends, myth and folk tales were preserved both in writing and art. It is difficult to trace the origin of Egyptian folklore, but the natural world and the immediate environment was an obvious influence on their mythology. Themes of fertility, new life, disorder and death are explained and symbolized within numerous stories and even found painted or carved within tombs, on amulets and in temples. Andrew Lang collected Egyptian fairy tales and compiled them in his popular and acclaimed Rainbow Fairy Books.